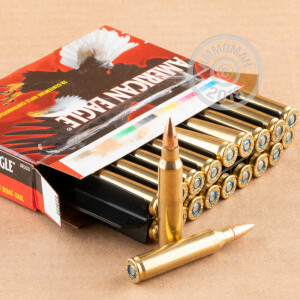 If you are looking for reliable and inexpensive ammunition for your AR-15, then this is the ammo for you! 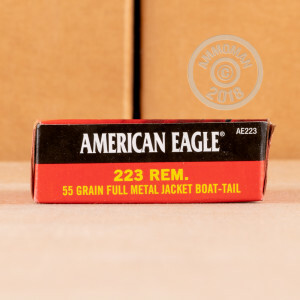 This 223 Remington ammo, by Federal American Eagle, is top of the line range brass. 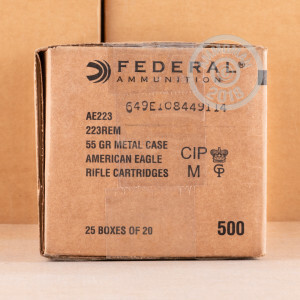 Federal is the single largest producer of small arms ammunition, including the 5.56 NATO, for the U.S. military. So, you know that you can trust Federal 223 Rem. This ammo is 55 grain FMJBT, and is perfect for sighting in a new optic, marksmanship training, or just plinking. The 223 Rem was developed in 1964, for use by the military, but was also made available in civilian varmint rifles. The 223 Rem became popular as a varmint caliber, and when the AR-15 was made available to the public, it became even more popular. Today, it is one, if not the most popular rifle caliber in the country.